Today’s photo is of a cultivated Begonia susaniae, taken in October of 2011. This image and the accompanying information about this begonia species was sent to us via email from Jacky Duruisseau, a begonia grower from France. Jacky aims to make begonias more widely known, and grows over 500 species himself from around the world (with two hundred of these having origins in continental Africa and Madagascar). Thank you Jacky for your photo and contributing greatly to the written entry! 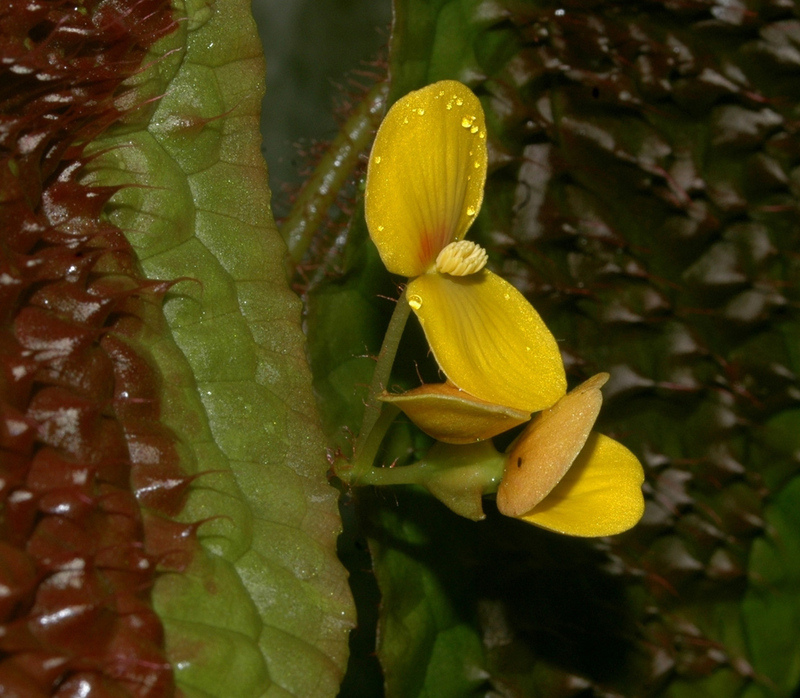 The Begoniaceae contains two genera: Begonia consisting of about 1600 species and Hillebrandia, a monotypic (single species) genus endemic to Hawaii. With this many species in Begonia, taxonomists have divided the group into approximately sixty different sections of closely-related species. Begonia susaniae belongs to Scutobegonia, a section containing about 25 species from tropical or equatorial Africa. Jacky notes that for begonia collectors, those that belong to the section Scutobegonia are rather mythical! He adds that this is partly because yellow-flowered begonias are rare. Also, those in this section are not easily grown in cultivation because they are self-infertile, making it difficult to obtain seed. Reproduction by vegetative cutting is the typical method of propagation. Begonia susaniae is native to Cameroon, Equatorial Guinea and Gabon. Jacky comments that he often observes this species in the primary forest of the Crystal Mountains in northern Gabon, where it grows on mossy rocks and slopes near streams at an altitude of 200-900 metres. He mentions the yellow flowers with distinctive bullate (or blistered) foliage look like lights in the semi-dark forest. I am certain that real lights would be useful to find these plants, as Jacky notes the the difficulty in finding these flowers–having to walk, climb, cross rivers, and paddle to get to them in the darkened forests, all the while warding off mosquitoes and leeches! His friends are often amazed at the idea of him going to Gabon on holiday, but Jacky insists that it’s rather the opposite; home is the holiday, given the challenge to see these plants in their native habitat. Aren’t plant collectors amazing people! After all that effort one can sympathise – and be grateful for – Jacky’s desire to share his success with the widest of audiences. Congratulations to him – especially for being there ‘on vacation’ in time to view it! Neat! The second equatorial African species of Begonia (that I can remember) on Botany Photo of the Day.